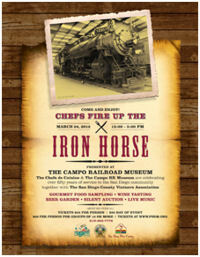 March 7, 2012 (Campo) -- The Chefs de Cuisine and Pacific Southwest Railway Museum in Campo are celebrating over fifty years of service to the San Diego community, together with The San Diego County Vintners Association. This savory event will be at the Campo Railroad Museum, located at State Highway 94 and Forrest Gate Road in Campo from 12:00--5:00 p.m. on March 24. The event features gourmet food sampling, wine tasting, a beer garden, silent auction and live music. There will also be train rides available. The museum is operated by volunteers, who are responsible for every phase of its operation. More than eighty major pieces of railroad equipment are on display, with many of them in various stages of restoration by the volunteers. You must be over 21 to attend the event. Tickets are $25 per person in advance and $30 on the day of the event. For groups of 12 or more, the cost is $20 per person. 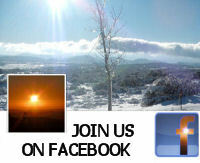 Tickets can be purchased at: http://www.PSRM.org or by calling 619-465-7776.